■ (SPEC) Iris suaveolens Boiss. & Reut. 1853, Botanical authors Boissier & Reuter. Iris suaveolens</ Boissier & Reuter (Pierre Edmond Boissie and Wilhelm Reuter, 1853, from Kustendje, Bulgaria); Section Iris. DB; Height 5" (12 cm). From original diagnosis: golden yellow, with falls originally flared but maturing reflexed and an oval brown-purple spot. The beard yellow with white into the throat. Standards shorter and wider than falls with pleated wavy edges; named for its sweet fragrance. Prodan, Bull Fac. Agr. Cluj 8, 14 1939, occur among Sintenis' plants from the Troad (K) (BM) and others were sent to Kew from Smyrna by Whittall (K). Curtis’s Botanical Magazine, t. 8472-8531, vol. 139 [ser. 4, vol. 9]: t. 8515 (1913) [M. Smith] The charming Iris which forms the subject of our illustration is one for the material of which we are indebted to the Hon. Mr. N. C. Rothschild, who has also presented the plant itself to the Kew Collection. It was obtained in the first instance, so Mr. Rothschild informs us, from Mersina, Cilicia. In referring this Iris to I. mellita it will be observed that Or. Stapf applies the name first employed by Professor Janka to a plant from Thrace in such a way as to include the Iris from Asia Minor described by Mr. Baker as I. rubro-marginata and at the same time yet another plant which fourteen years ago was introduced by the late Mr. Max Leichtlin to European gardens, ostensibly as a native of Western Persia, under the name I. Straussii. In connection with the expression of this more comprehensive view it may be remarked that Professor Velenovsky, whose local knowledge is so exhaustive, admits that I. rubro-marginata, Bak., and I. mellita, Janka, are identical, and that Mr. Dykes, in his recent authoritative review of the genus, does the same. The presence of a purple edging to the leaves and spathes, whence I. rubro-marginata derived its name, is, as Mr. Dykes has pointed out, an unstable feature. Apart from this character the Asia Minor plant, judging from herbarium material, differs from the Thracian form mainly in having somewhat stouter rhizomes and broader leaves, with practically no stems. The plant here figured is, then, a ''rubro-marginata" without any trace of the purple edging. In the specimens of I. Straussii, Leichtl., as cultivated at Kew, we find the broad leaves of I. rubro-marginata but a distinct stem. The Kew plants are from rhizomes communicated by the late Mr. Leichtlin in 1899, the year in which the description of I. Straussii first appeared. Mr. Dykes has stated that more than one species has been put on the market as I . Straussii he even appears to doubt whether the I. Straussii originally issued by Mr. Leichtlin came from Sultanabad in Persia. 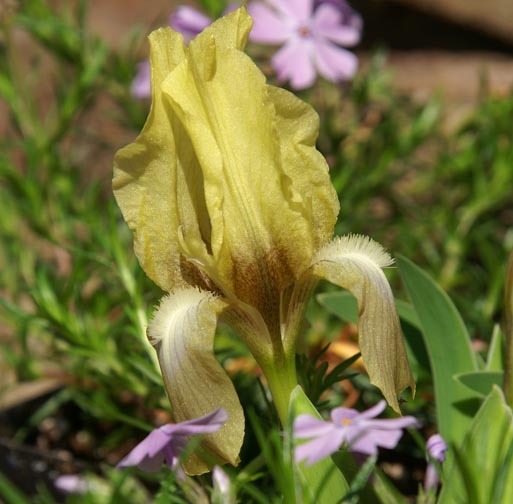 As to the latter point it is clear that about 1898 Mr. Leichtlin did receive from Mr. Strauss an Iris from Sultanabad which he named I. Straussii in compliment to its contributor. It is also certain that Mr. Leichtlin distributed specimens of an Iris under that name, and it is certain that the description of I. Straussii in the " Revue Horticole " for 1899 exactly fits the plant sent to Kew under the same name in the same year. The suggestion that the confusion to which Mr. Dykes alludes was created by Mr. Leichtlin at the outset, is not borne out by the evidence at our disposal. If such a contusion arose later on, there is no trace of its existence among the plants sent by Mr. Leichtlin to Kew. So far as existing knowledge goes, these Thracian, Anatolian and Persian plants are not more than forms of the same somewhat variable species. Janka originally described I. mellita as having dull violet or purplish flowers, with a bluish-white beard, Velenovsky has in one passage termed them violet or greenish-violet; in another " most often violet but some-times dull violet, rarely yellowish." The original I. rubro-marginata had uniformly lurid purple flowers; the I. Straussii of the " Revue Horticole " had brownish and violet flowers. 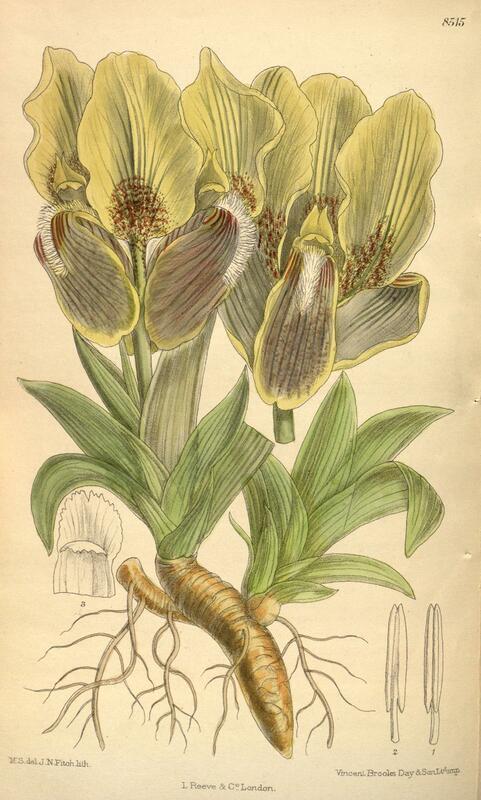 In a drawing made at Kew in 1901 of one of the plants of I. Straussii communicated by Mr. Leichtlin the flowers are brownish-violet, the standards being of a clearer and deeper colour; the falls and the standards are brownish at the base with just the mottling shown in the yellow form from Mersina now figured. The veining of the claws of the falls and the colouring of the beard also agree, except that the tips of the hairs of the latter are of a deeper blue. The original I. mellita was first collected by Janka in 1871 on dry grassy slopes on Tschiendem Tepe near Philippople in Bulgaria; it has since then been frequently met with throughout southern Bulgaria. The original I. rubro-marginata was described from specimens collected near Scutari by Mr. W. Barbey of Geneva, but it has since been sent to Europe from Smyrna. The plants at Kew received and grown under the name /. Straussii thrive satisfactorily in well-drained loamy soil in a border on the south side of a warm building, where they flower annually but do not ripen seeds. Description. — Herb, rootstock as thick as the index-finger or less. Leaves densely tufted, ensiform and more or less falcate, at flowering time up to 2 1/2 in. long, over 1/2 in. wide, later on elongated, green, smooth, with about 6 slender primary veins on each side. Stem very short or at times up to 4 1/2 in. long, usually 2-flowered, sometimes 1- or 3-fiowered. Spathes herbaceous, remaining green for a considerable time, oblong-lanceolate, acuminate, somewhat swollen, keeled, diverging and displaying the perianth-tube; the larger up to 2 1/2 in. long. Pedicel very short. Perianth with a greenish tube blotched with red upwards, 1 1/2 to 1 3/4 in. long, occasionally longer and exceeding the spathes; outer segments with a deflexed, obovate-oblong, slightly emarginate limb appressed to the tube, 1 1/4 to 1 1/2 in. long, 2/3 to 3/4 in. wide, lurid purple or yellow, with distinct longitudinal veins reddish towards the base ; beard bluish-white ; claw 1-1 1/4 in. long, wide cuneate, faintly red-veined ; inner segments erect, wide oblong, suddenly contracted into a red-blotched claw, blade 2 1/4 to 2 1/2 in. long, 1 1/4 in. wide, lurid purple or yellow, blotched and streaked with red near the base, margin undulate. Stamens with white filaments rather shorter than the whitish anthers. Ovary cylindric, narrowed to the apex, 2/5 in. long; style-arms narrow-oblong, 3/4-1 in. long, pale, crests with obliquely wide-ovate toothed lobes. Capsule 3-gonous, 4 in. long. Seeds sub-globose, deep reddish-brown, rugose. Rootstock , a compact rhizome with crowded tufts of leaves. Leaves , thin, ensiform, more or less fulcate and occasionally tinged with red at the edge. 3-5 in. by¼-½ in. Stem , 1-headed, very short or as much as four or five inches in length. Spathes , quite green, sharply keeled, closely resembling the leaves, remaining green long after the flowers have faded, sometimes flushed with red along the edge, acuminate, slightly ventricose, divergent, and exposing the tube. 1-3-flowered, 2-3 in, long. Ovary , cylindrical with six lines at equal intervals. Tube , 1½--2 or more inches long, greenish mottled with purple. Falls , shorter and narrower than the standards, obovate cuneate, with the blade much reflexed and often pressed against the tube. The colouring is peculiar, the haft being veined with red brown on a grey white ground. On the blade the ground is a pale smoky brown veined with fine deep veins. About the end of the beard the texture is more velvety and the colour becomes a warm red purple shot with electric blue. The beard is conspicuous, composed of relatively long, thickset hairs, white at the base and blue above. Standards , obovate with a short channelled haft, which on its inner surface usually bears a few straggling hairs. The standards are both longer and broader than the falls and deeper in colour, but with similar fine veins. At the base the veins give place to small dots and blotches. Styles , narrow, grey white, with a purple keel. Crests , small, triangular, with a serrate outer edge. Filaments , white, tinged with purple. Anthers , white, tinged with blue. Capsule , trigonal, tapering slightly to a pointed upper end, with thin walls, 2-2½ m. long. Seeds , almost spherical, deep red brown, wrinkled. I. mellita seems to stand in much the same relation to I. Reichenbachii as I. pumila to I. chamaeiris. The Balkan plants are distinguished by their sharply keeled spathes and by the clear thin texture of the segments of the flowers. From I. Reichenbach ii I. mellita is separated by the long narrow spathes and by the relatively longer perianth tube. The development of a short stem, which is rare in examples of I. pumila, is fairly common in I. mellita, where it may vary from less than half an inch to as much as four or five inches. This was pointed out by Janka in his original description' and it is clearly seen when a number of specimens are compared together. Thus specimens from the neighbourhood of Philippopolis have stems some less than one inch and some more than four inches in length, while some of the Troad specimens have stems of barely ½ in. When the stem is so short that it is entirely clothed by the bases of the leaves, the whole plant closely resembles I. pumila except that it has that look of refinement which is characteristic of the Balkan as opposed to the Austrian and French dwarf Irises. Botanically, the difference lies in the spathes. In I. pumila these closely wrap the tube and the inner valve at least is membranous and at the tip even scarious. In I. mellita, on the other hand, the spathe valves are divergent, exposing the tube, and remain green long after the flowers have faded. Moreover, they are very acutely keeled and closely resemble the leaves that clasp the stem. In fact the leaves only differ from the spathes in that the two surfaces are joined together along both edges for a short distance below the apex. In cultivation, I. me!lita is distinctly a plant for the rock garden, where it does well in a sunny, well-drained position in a limestone soil. It should be transplanted every two or three years, for these small Irises seem to exhaust the soil within reach of their somewhat limited root-system, if left too long in the same place. The only alternative is to topdress the plants in spring and autumn with a mixture of limestone chips and old leafsoil, but this plant has the disadvantage that unless great care is used the rhizomes may become too deeply buried, in which case the plants will not thrive. Seeds are easily obtained by artificial pollination and the young plants grow rapidly and should flower in a year from the time the seedlings appear. The variety rubromarginata, which was discovered by Barbey, the son-in-law of Boissier, near Scutari, was described as a species by Baker, possibly before he had seen the description of Janka's I. mellita, which only appeared in the previous year. In the original description the only difference is found in the length of the stems and this is admittedly variable in the case of I. me!lita. When Janka republished his paper in 1876, he made rubromarginata differ from I. me!lita in its obtusely and not acutely keeled spathes, though the authority for this statement is not obvious, seeing that Baker had described his plant as having acutely keeled spathes. After cultivating side by side for some years some plants, which Mons. Correvon tells me came from Barbey's original collection and specimens of I. me!lita from the Balkans, I am convinced that they must be looked upon as varieties of the same species. Specimens of rubromarginata vary in the amount of red on the leaves. This feature is most prominent in early spring and on new growths at any time but sometimes it is quite inconspicuous and seems in any case to fade away as the leaves mature. Moreover a red flush is not unknown on I. mellita from the neighbourhood of Mt Rhodope and we may also compare such varieties of I. germanica as Kharput and Amas, whose leaves show the same feature at early stages of their growth. The variety rubromarginata is always apparently very dwarf and the young red flushed leaves therefore appear from the first more falcate than those of I. mellita, although the central leaves of each tuft are quite erect. The flowers both of the type and of the variety agree closely in their colouring, shape and proportions. Since the red edge to the leaves disappears as they are dried, it is usually impossible to separate the variety from the type among herbarium specimens, which may be distinguished from I. pumila by the divergent, herbaceous, sharply keeled spathe valves. Mathew treats the following as synonyms: Iris mellita Janka, Iris glockiana O. Schwarz, Iris rubromarginata Baker, Iris jugoslavica Prodan, and they are described here as cultivars.